A teaching resource suitable for Key Stage 2 and 3 with lots of ideas and activities to enable you to run a descriptive writing competition in your school. 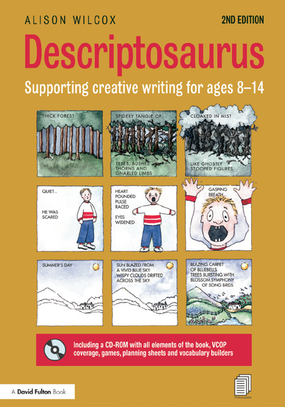 Based on the popular Descriptosaurus series, pupils are challenged to focus on a scene and zoom in to describe the setting, the characters and the interaction between the two factors. There are two versions of the teaching resource: the first contains suggested activities, whist the second also includes character cards, planning templates and setting prompt cards (39 pages in total). There is also a poster that outlines the challenge and gives pupils some top tips. These resources were produced in partnership with David Fulton Books from Routledge for a competition we ran in 2013.